Forza Horizon 4 takes the open-world racing subseries to a new location – the English countryside. We saw lots of farmland and fences in the gameplay demo at the Microsoft presentation, though there wasn’t much hint about how much urban racing we should expect. Now we at least know one city that will be in, and one that won’t. London is definitely not there, but you can expect to race around Glastonbury. The small town is probably best known for its music festival, and we’re pretty sure you can spy the Glastonbury Pyramid Stage in the background of the image above. That fits in with the festival atmosphere of previous Horizon games, and it’s something that will continue with the fourth iteration. Can’t wait for Horizon? Check out the best PC racing games. 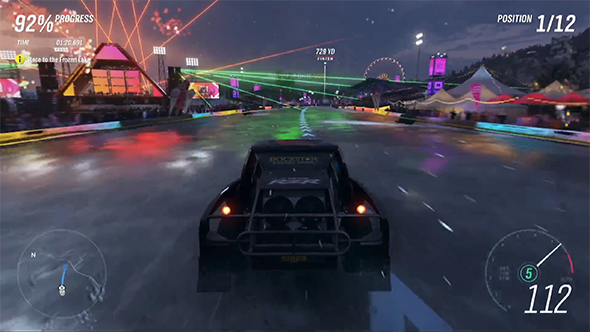 Seasons were a big part of the initial presentation, and during a livestream interview with GameSpot, the developers clarified how that will work. Time will be synced for all players, with each season lasting for one real-world week. But those rotations won’t always be the same, with each winter, spring, summer, and autumn being different from the last thanks to post-launch additions. The developers say that property ownership will be a big part of the game, letting you buy up locations ranging from quaint cottages all the way up to Edinburgh Castle itself. These locations can serve as houses for you, and you can even start your own businesses. Forza Horizon 4 is currently scheduled for release on October 2, and like most of Microsoft’s first-party titles it will be available through Game Pass on both Xbox One and the Windows Store from day one.